Find out more about Susan's TV series on PBS & the CREATE Channel. OIL. NEW Book Release. We are excited to share a book brimming with beautiful paintings by Mother and Daughter, Nancy & Terrie Brown. 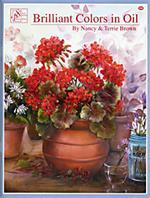 Lush red geraniums brimming out of a terra cotta pot in a lovely floral arrangement. The Blue Door, a personal favorite. 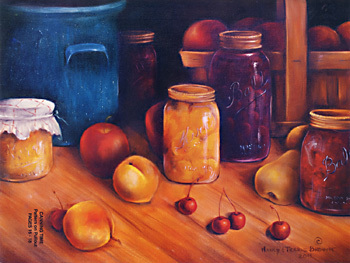 Canned peaches, cherries, apples & pears create a yummy warm still life. Delicate soft lilacs brim over a golden brass bowl. 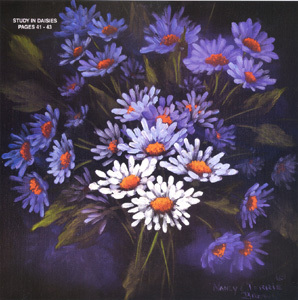 Daisies In Red and Study In Daisies (periwinkle / violet & white) have a painted over a dark background on square canvas add a pop of color. Poppies On MY Table features a silver tea pot spilling over with an arrangement of fresh white daisies and red poppies. 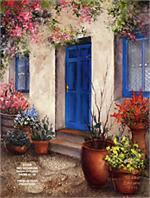 Garden of Flowers is a luminous, garden image of pink poppies, violet flowers and clay pots beautifully painted. There are more beautiful paintings to discover in this lovely oil book. 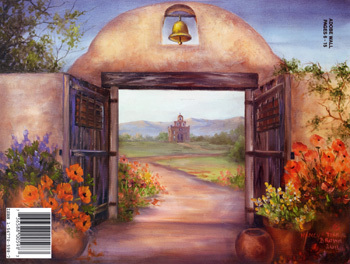 All on-line orders will be shipped when credit card verifications are received. Please make all claims for damage or shortage promptly upon receipt of shipment. This will enable us to correct the situation in a minimum amount of time. Please do not return merchandise without our permission. All sales of books are final unless damaged in the shipping process. Orders outside the US are calculated on a per order basis depending on quantity of books and country shipped to.